'Charlie,' that is your name, isn't it? "I got to tell you, Doc. This Charlie Sheen character is killing me," said Charlie Sheen as Charles ‘Charlie’ Harper the fictional character from the hit CBS sitcom, Two and a Half Men, as he sat eyes closed in a hypnotic state induced by Dr. Phil before a live studio audience of the Dr. Phil Show. "I can’t keep up with the guy. He’s an animal. Some kind of wild thing that’s constantly on the prowl, devouring all life; he’s sucking the marrow out of my bones." "For those of you just now joining our show today," said Dr. Phil as he sat directly across form the troubled actor, Charlie Sheen, who was deep in a trance. "I have the star of the sitcom TV show Two and a Half Men here with me today. Now I have placed both Charlie Sheen and the fictitious character he portrays Charles Harper or ‘Charlie’, in a deep hypnotic meditative state in an attempt to convince him or them to attend Rehab and stay there until he’s cured or they are cured. I know this method maybe a little unorthodox. But in this case, I believe a little unorthodoxy is exactly what the doctor ordered." 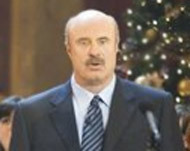 Some nervous laughs and coughs could be heard in the audience as Dr. Phil continued with his psychoanalysis of a real person through a fictitious character. "Now, for lack of a better word, are you still channeling Charlie now ‘Charlie’?" asked Dr. Phil, as he scribbled something down on a notepad. "Yes, yes I am," replied ‘Charlie’ from a deep trance like state. "May I ask you what’s Charlie doing right now, ‘Charlie’?" asked Dr. Phil. "Yeah, sure, why not? It’s a free country, right?" said ‘Charlie’ as he nervously rubbed his thighs. "Ah, um, it looks like he’s sitting in his living room." "Is he alone?" asked Dr. Phil. "No. His definitely not alone, Doc," replied ‘Charlie’ with a wide smile on his face. "So he’s with somebody then?" asked Dr. Phil. "Yeah. You could say that, Doc. In fact, you could say he’s with some bodies," quipped ‘Charlie’, drawing roars of laughter and applause from the studio audience. Even causing Dr. Phil to briefly lose his composure. "I just know I’m going to kick myself later for asking you this next question, but here it goes," said Dr. Phil with a smile on his face. "But who exactly is Charlie with ‘Charlie’?" "He’s surrounded by beautiful women, of course," replied ‘Charlie’, as the audience continued to laugh, giving their tacit approval of the bad boy behavior. "And what’s he doing with them, ‘Charlie’?" asked Dr, Phil, while biting his lower lip, anxious giggles rising up from the audience. "Excuse me, Doc," said a very polite ‘Charlie’. "Did you ask me what Charlie was doing, or who he was doing?" Another burst of laughter erupted from the studio audience. This one bigger than the one before, as Dr. Phil slapped his own knee, laughing out loud. "I knew that was coming," said Dr. Phil as he removed his eyeglasses to rub his eyes. "I just walked right into that like a rabbit on a hot desert highway." "High? Who said Charlie was high? I didn’t say he was high," said ‘Charlie’ as he peeked out at the audience with one eye open, apparently not in any trance at all, pointing at members in the audience, asking them "Did you? How about you? I bet it was you?" "We’ll be right back after this brief message from our sponsors," said Dr. Phil as he leaned over to shake ‘Charlie’s’ hand. "And let’s see if I can compose myself and get to the bottom of this." "What? Did I hear someone say bottom?" continued ‘Charlie’ with his childish schoolboy antics as the audience and Dr. Phil broke out into laughter again, the camera pulling back for a wide shot, cutting to commercial break and station identification.